Gerri Hanus is now part of the Stitching Pretty family, adding more depth and breath to this creative and diverse group of designers. Gerri’s designs will delight and challenge you with a variety of stitches and threads, most often worked on linen and canvas. Gerri always knew she would design her own pieces some day…and had the name of her design company, Amelia’s Heir Designs, long before this became a reality. She dedicates all her designs to her grandmother, Amelia Miller, who taught her the joy of creating with needle and thread at a very young age. 8 x 11 on 18ct Canvas. Chart gives instruction to change ribbon color to represent different Cancer. 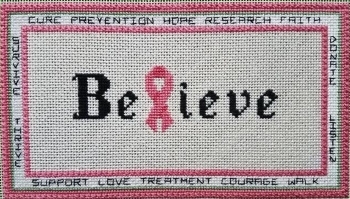 $1 will be donated to the American Cancer Society by the designer, for each chart sold.